Is there any person who does not have a music player app in their Android phone? Android music players are known to be one of the first apps to be installed whenever one buys a new smartphone. However, there are millions of Android music players available on Google Play Store. Some are free and some paid. Since most of the readers are not interested in the paid version, we have reviewed the six best Android music players to look for in 2019. Despite some Android music players being free, there are some that come with a price. There are some of the music players that contain ads. However, if the ads are irritating, you can always restrict internet access to the app by using firewall app. In case you get your favorite among the best Android music player, you can always upgrade to its pro version. 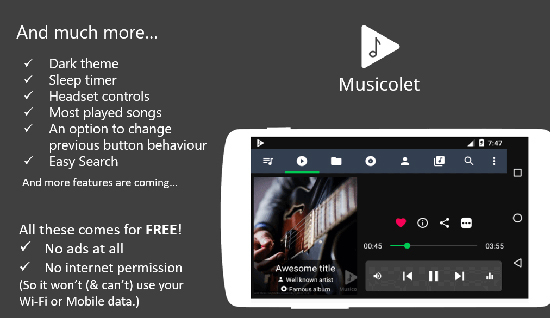 Musicolet refers to a lightweight best music player for Android that consists of several features. This music player allows one to control their music by using their earphone button. One click to play/pause, double clicks to play the next track while triple clicks move one to the previous song. It is also possible for one to fast forward the song using four or more repeated clicks. Musicolet claims to be the only Android music player app that is capable of supporting several playing queues. Musicolet is known to have an intuitive graphic user interface that has easy to access tabs for playlists, artists, folders and albums. It also contains an equalizer, sleep timer, lyrics support, widgets and more. It is considered to be among the top best Android music player 2019 since it offers unparalleled experience and has great functionality. *1. Comes with advanced music control with earphones. *2. Has support for Android Auto. *3. It has multi queue manager and an option to set more than 20 queues. *4. Comes with a tag editor for editing album arts for several songs at a go. Spotify is one of the most popular and earliest music streaming services currently available in the market today. This app is available for almost every platform from home assistants to cars to phones, computers, tables and high-end speakers. The prowess of Spotify with algorithm music and data analysis has made this service very addictive for most of the music hungry users. It is also the first service that offers student pricing which made it spread like wildfire in universities and colleges. *1. Has a great User Interface. *2. Comes with best in class features. Tips: With free account on Spotify, you can only need to Spotify music and playlists online with ads. It’s not so convenient to enjoy music entertainment, such as you are out of internet. So, you can use DRmare Spotify Music Converter to download and convert Spotify files to MP3 and transfer converted Spotify tracks to any other device for offline playback without ads. Phonograph refers to an enticing app that contains a neat material design user interface. Its user interface dynamically changes to match the colors according to the on screen content. 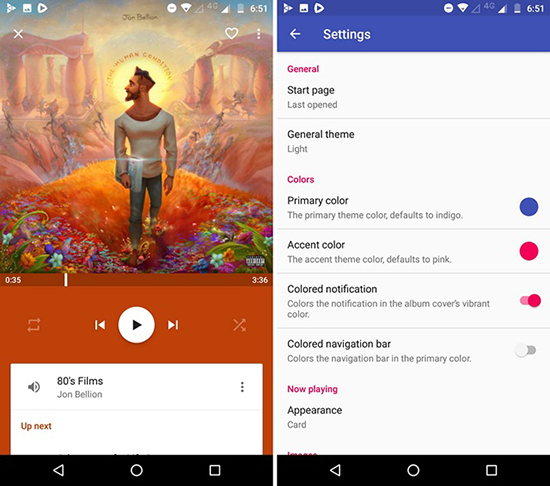 The theme of this Android music player enables one to customize the player they are interested in. 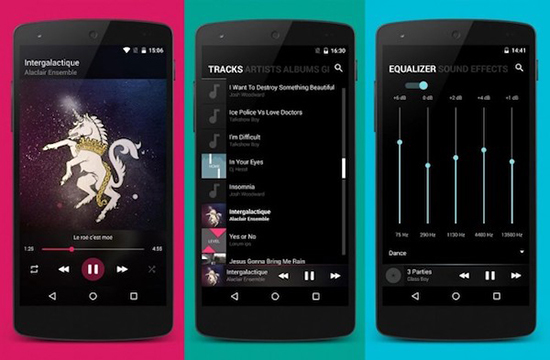 This Android music player app is not just good looking but it also consists of rich features. Phonograph downloads any missing information concerning the media automatically. Its tag editor allows one to edit such titles with ease. *1. Comes with an inbuilt theme engine that makes extensive customization possible. *2. Library categorization into playlists, albums and artists. Pulsar is a lightweight and completely free Android music player making it among the most preferable music player apps for most users. It is simple, ad free and has been beautifully designed using great animation and user interface. It is possible to customize its user interface using different color themes. One can easily sort the library view of Pulsar music player by folders, artist, album and genre. This app also offers other excellent features such as built in tag editor, gapless playback, last.fm scrobbling, 5-band equalizer and a home screen widget. Despite being small in size, Pulsar is still considered to be among the best Android music player app one can always check out for. *1. Speedy search across songs, artists and albums. *3. Chromecast and Android auto support. Google Play Music refers to a free Android music player app that enables one to upload their own music collection online. This makes it possible for one to stream it from any place they are. The Google Play Music log in process is quick since you can do it using your existing Google account. Its app and website are easy to use. The Google Play Music can work in a browser just like a regular website. However, it is compatible with mobile devices, Android TV and Chromecast. *1. You can connect up to 10 devices to your account. *2. You can always pay for unlimited access of songs. *3. You can store up to 50,000 songs. 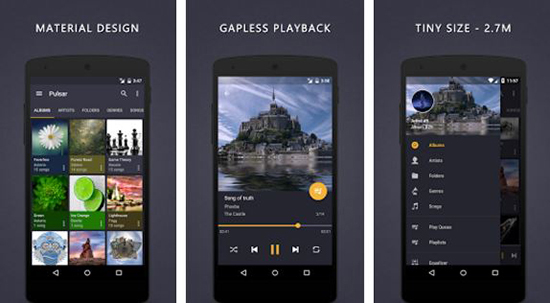 BlackPlayer is considered to be one of the best free music player for Android that consist of several great features. This app has been designed with customizable user interface which can be controlled by use of gestures and swipes. You can always change the user interface color and font precisely using custom values. This Android music player app is packed with sleep timer, widgets, ID3 tag editor, changeable themes, gapless playback and much more. It also supports the standard local music file format like OGG, WAV and MP3. It is ad free and can be downloaded for free in Google Play Store and Spotify. It is also possible to get a paid version that comes with extended features. *1. Edit and View embedded lyrics. *2. Comes with a 5-band equalizer. *3. Supports WearOS and Android Auto. 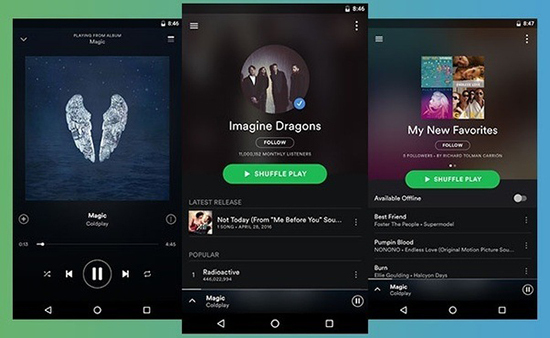 With several music streaming player apps providing the functionality of downloading offline playback songs, the best music player apps for Android have been made to become almost obsolete. In case you are interested in an Android music player for your device, you can always choose any from the above list. Home | About | Upgrade & Refund | Privacy | Term of Use | Sitemap Copyright © 2019 DRmare. All Rights Reserved.